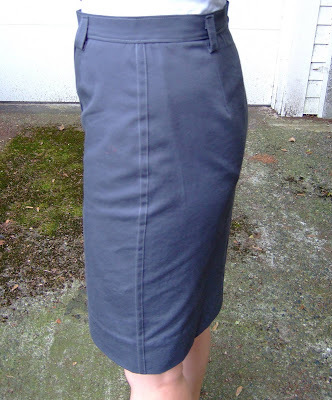 I decided to make a skirt to go with my new BWOF blouse, and I've had McCalls 5330 on my wish list for a few months. Sharon has made 4 great skirts from this pattern and I love Erica's denim version, so I figured it was worth a try. This pattern definitely did not let me down - I love this skirt! I didn't make any alterations to the pattern and it fits me great right out of the envelope! Gotta love that. I sewed the side seams as flat fell seams. I didn't have any topstiching thread so I just used my regular all-purpose thread for the topstitching. Next time I will certainly get some topstitching thread for the added stitch definition. Love it! I am seeing this in a black wool for the cooler weather. This was very quick to make up, I finished most of it in a day. Oh how cute! I love the buttons! Was that not the easiest skirt to make... took no time at all! I'm kinda new here, finally got a blog started, but I've been lurking! I love your new outfit, a strong skirt with a soft blouse, that is a great look. Then again, the skirt can go into fall. Love the contrasting buttons. BTW, I bought Lost Cities on your recommend, got to get the hubby and I doing more together. I'll let you know how it goes! Great Skirt! The buttons are so cute. It looks great and matches the shirt so well! What a great new outfit!! Great outfit. 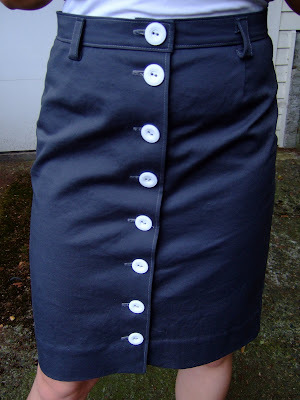 I wanted to make a skirt like with buttons down the front too but I'm looking for one with an A-line shape. Seeing yours gives me the kick I need to go find the right pattern. Again, yours looks so cute. I can see it going well with so many things. Very cute! I LOVE those buttons!!!! !